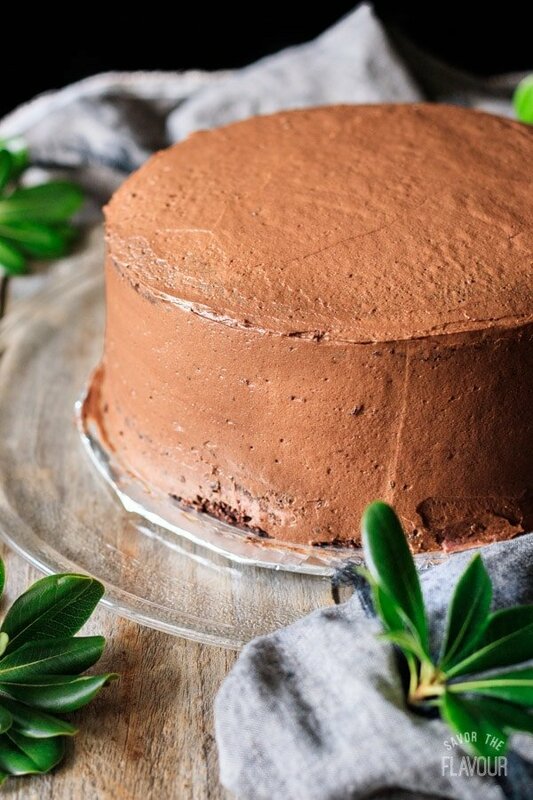 Need a slice of chocolate decadence? 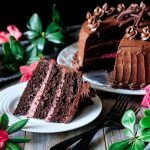 This super easy recipe for sour cream chocolate cake makes an ultra moist cake with sour cream and coffee. It would be a fun treat for a birthday or Valentine’s Day! 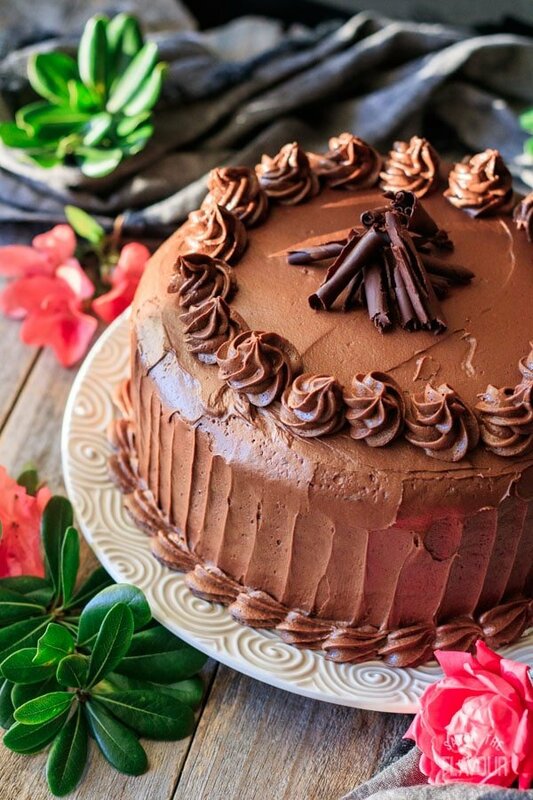 Who needs a box mix when you can make an awesome cake from scratch? 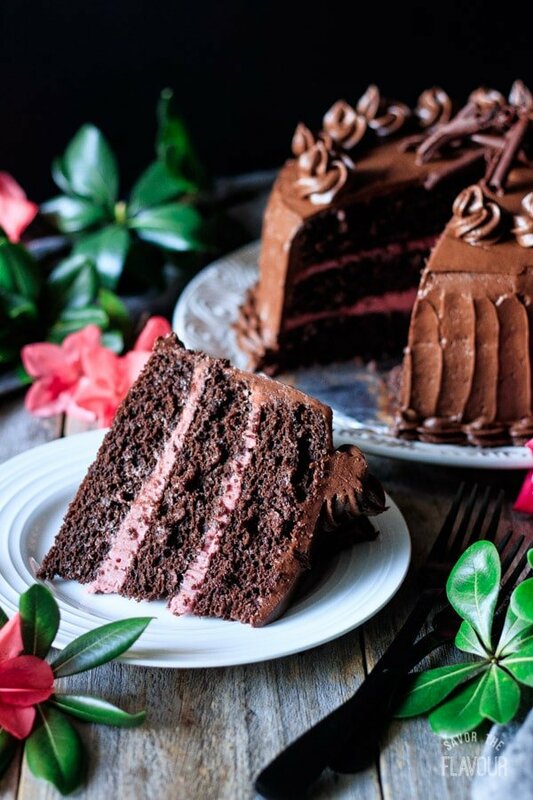 This sour cream chocolate cake (and its highly coveted raspberry buttercream) has been a deep dark family secret for several years. We love this recipe for its fluffy crumb, moist texture, and rich chocolate flavor. 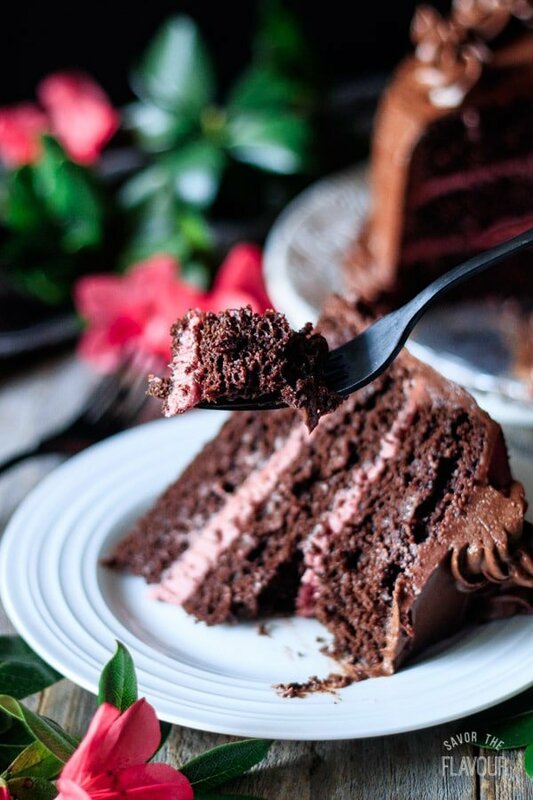 It’s the perfect birthday or Valentine’s Day cake! Why do you put sour cream in cake? Sour cream helps make the cake fluffy and moist, and its slight acidity helps counteract the sweetness of the other ingredients. For more information, read this article from Food Crumbles. Why do you mix dry and wet ingredients separately? It’s important to mix the dry ingredients and wet ingredients in separate bowls before mixing them together. 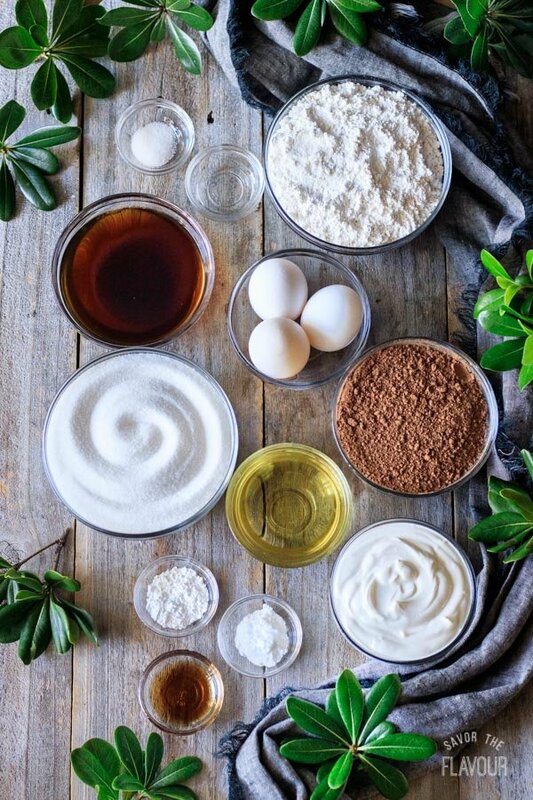 If you try to mix everything together at the same time, it’s easy to overmix the batter, which would result in a tough cake. 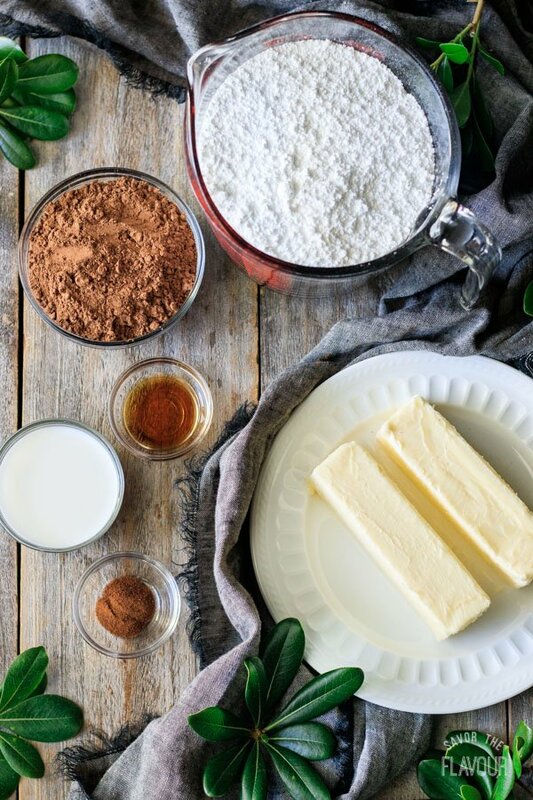 Gather the ingredients for the cake, making sure they are all at room temperature. 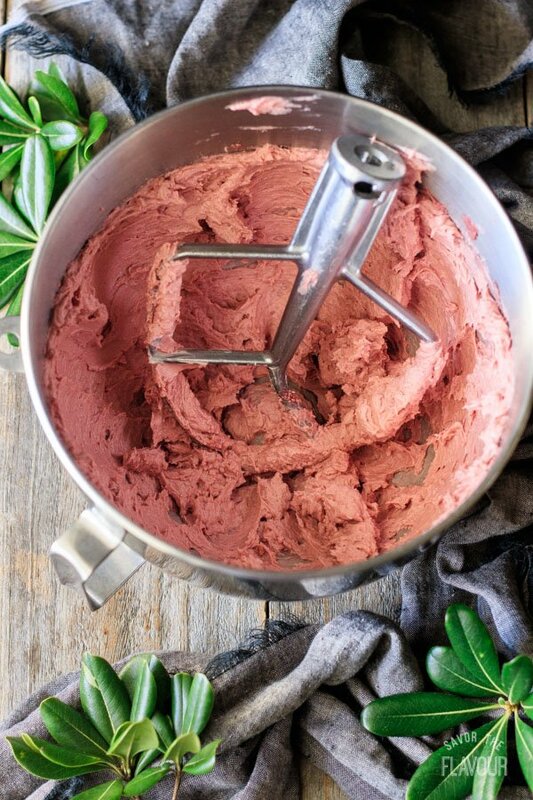 Sift the dry ingredients into a large mixing bowl to remove any lumps, then whisk until blended. 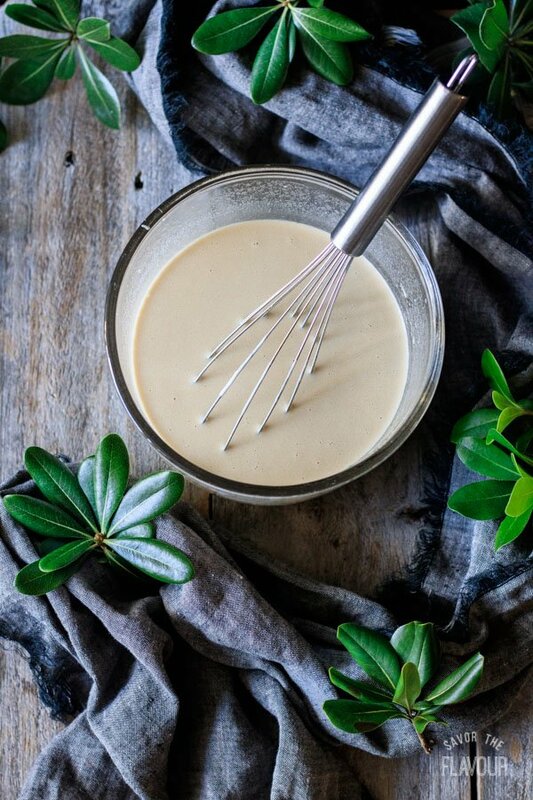 Whisk together all the wet ingredients in a separate bowl until fully combined. Pour the wet ingredients into the dry, then stir until fully combined. Make sure to scrape the bottom and sides of the bowl to get all the flour mixed in–you don’t want any streaks or lumps of flour in the batter. Divide the cake batter among three 9-inch cake pans that have been buttered and lined with parchment paper. Bake the cakes at 350 F for 17-20 minutes, until a toothpick inserted in the center comes out clean. Let cool in the pans for 20 minutes, then remove from the pans and let cool completely on a wire rack, about another 40 minutes. 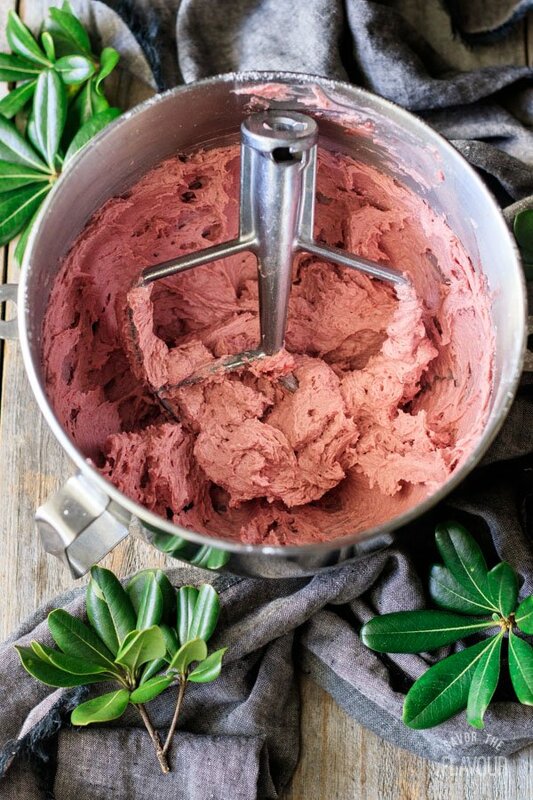 While the cakes are cooling, make the raspberry buttercream. 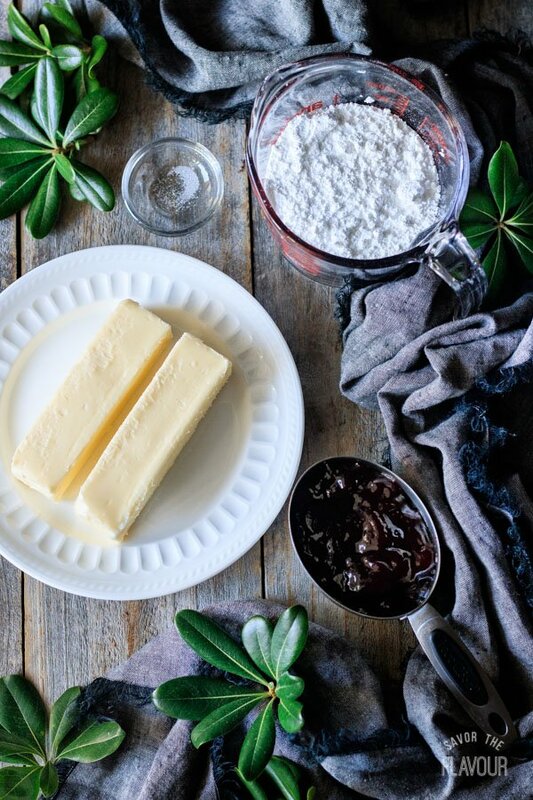 You’ll need unsalted butter, powdered sugar, seedless raspberry jam, and a pinch of salt. Beat together the butter, salt, and jam until smooth. Scrape down the sides and bottom of the bowl, then sift in the powdered sugar and beat until fluffy. Once the cakes have cooled, flip them over onto pieces of plastic wrap (the cakes will be moist and sticky) and peel off the parchment paper from their bases. 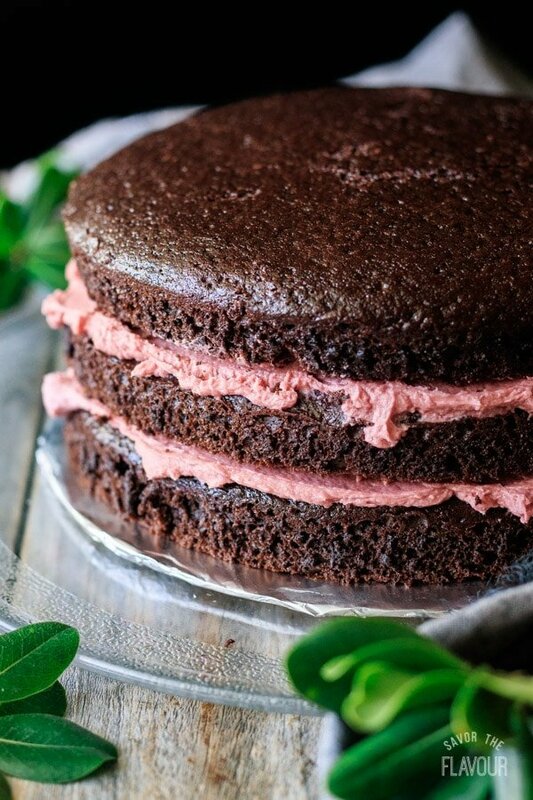 Sandwich the cakes together with the raspberry buttercream. 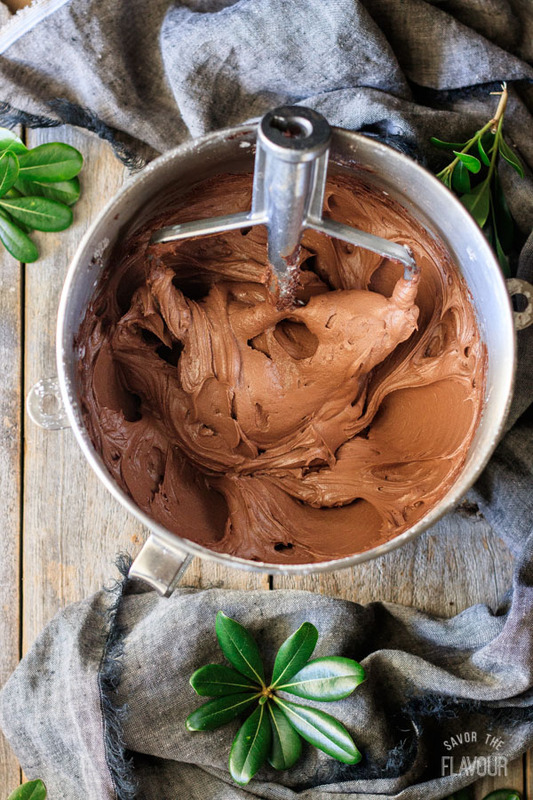 Now, gather the ingredients for the chocolate buttercream. 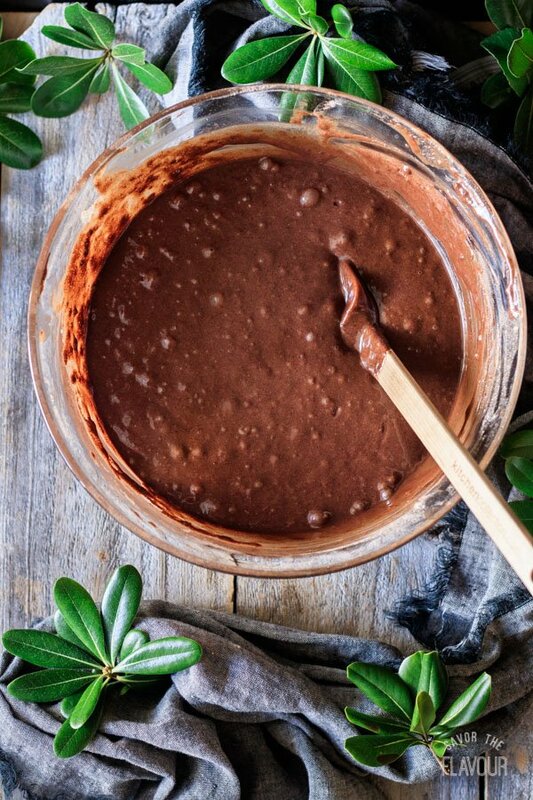 You’ll need unsweetened cocoa powder, powdered sugar, unsalted butter, milk, vanilla extract, and espresso powder. 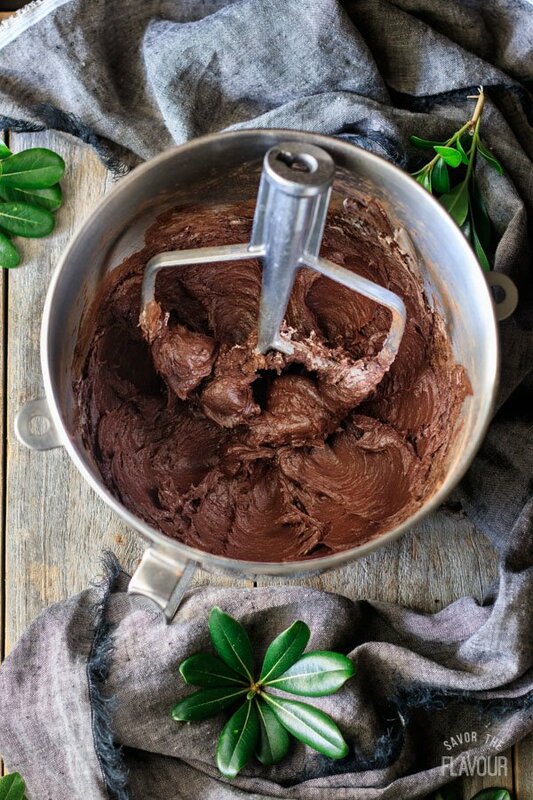 Beat the butter until smooth, then sift in the cocoa powder and beat until well mixed. Scrape the bowl and paddle, sift in the powdered sugar, and mix until blended. 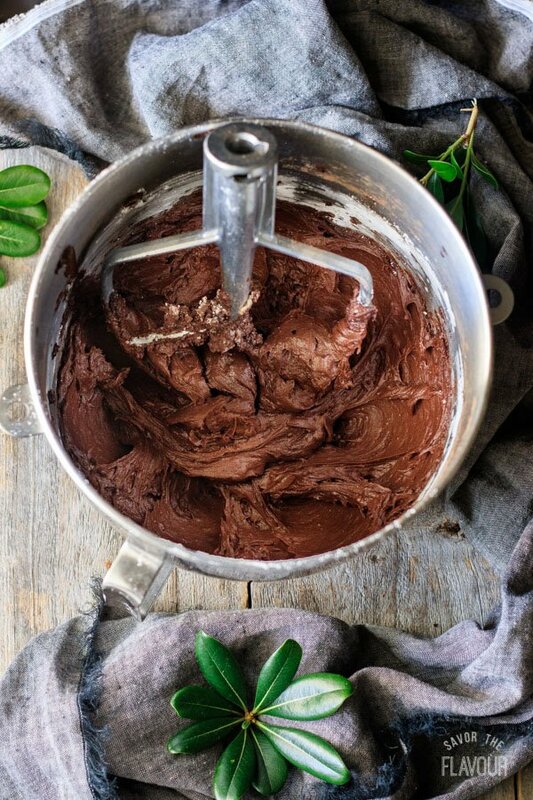 Add the vanilla and espresso powder to taste, then gradually add enough milk to make the icing a beautifully silky and spreadable consistency. Be careful not to overbeat, or the icing will have lots of air bubbles in it, making it hard to smoothly ice the cake. Spread a thin coat of icing over the top and sides of the cake with an angled spatula, then scrape off the excess. This is called the crumb coat, and is a crucial step for getting a smooth, crumb-free finish on the cake. Chill the crumb coated cake for 30 minutes to harden up the buttercream, then spread on the remaining chocolate buttercream. Pipe swirls of icing and top with chocolate curls as desired. Want to make this a sheet cake? 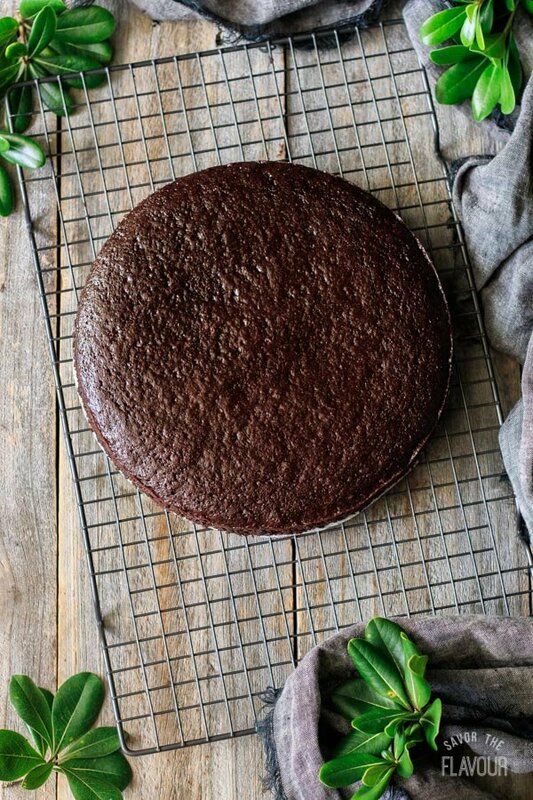 Cut the batter in half and bake the cake in a 9 by 13-inch pan. You may need to bake the cake a few minutes longer, but check it a little early just to make sure it’s not overbaked. Don’t want to make any icing? Use raspberry jam instead of the raspberry buttercream, and sprinkle icing sugar on top of the cake to decorate. Want to prep ahead of time? Mix together a batch of the dry ingredients up to 3 months ahead of time and store in an airtight container or zip-top bag until needed. 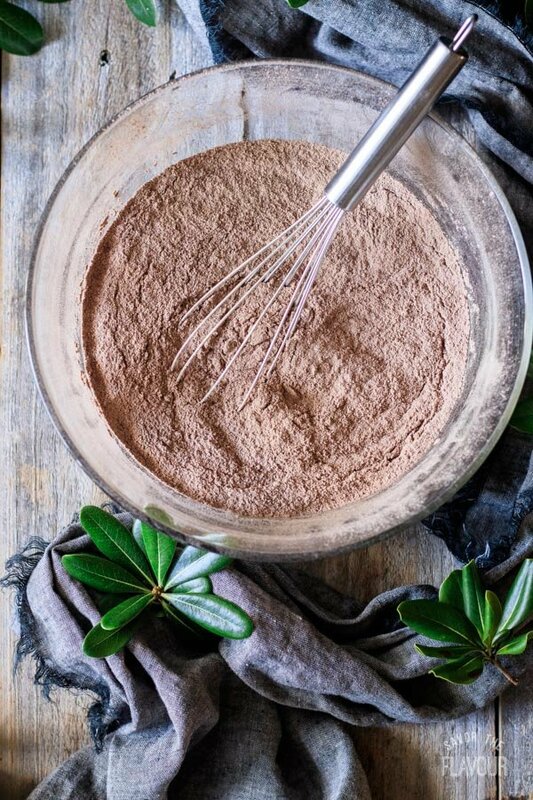 Just make sure that you use fresh baking powder in the mix, as it loses its effectiveness after 3 months. You can also freeze it. Use good-quality ingredients for the best flavor and texture. Don’t overmix the cake batter, or the cakes may be tough. Check the cakes a little before you think they may be done, as overbaked cakes will be dry. A toothpick inserted into the center should come out clean. Add a little milk to the icing if it is too thick. Crumb coat the cake by spreading a thin layer of icing over the top and sides, then scraping most of it off. This will keep most of the crumbs from getting into the frosting later. 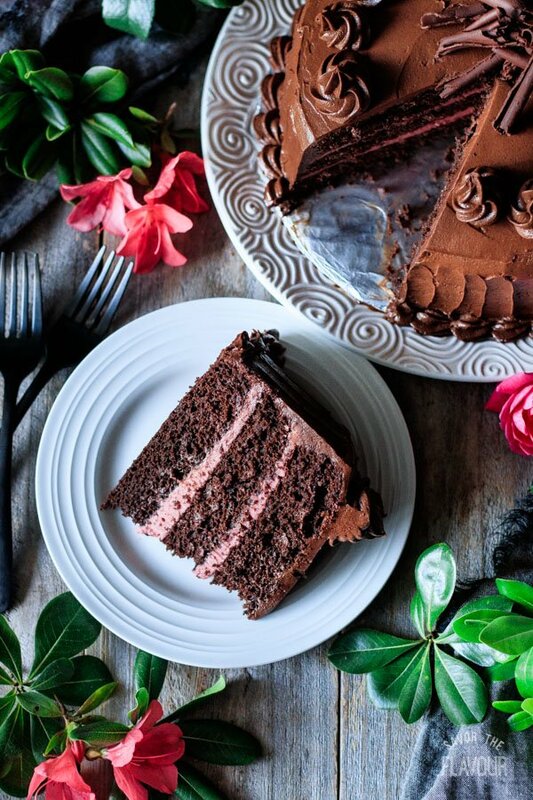 Store the cake in the fridge until ready to serve. 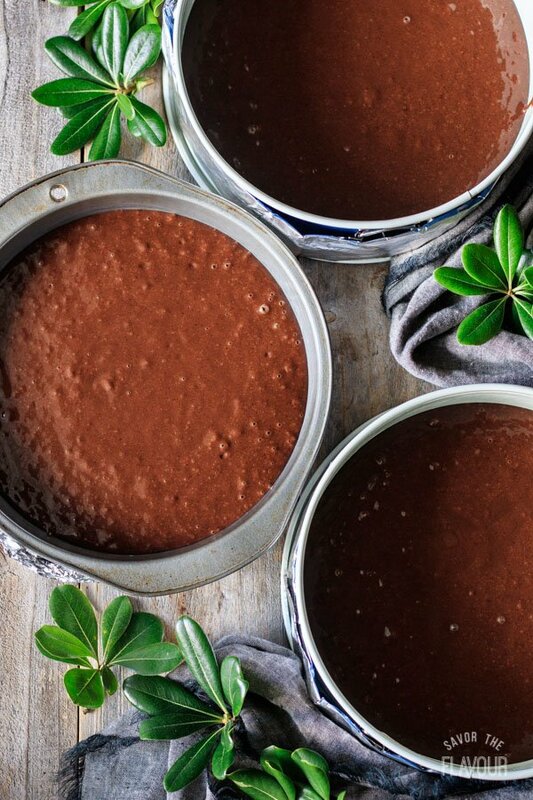 Freeze leftover cake in airtight containers or zip-top freezer bags for 1-3 months. Wow your family and friends with these delicious layer cakes. 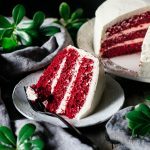 Southern Red Velvet Cake: a light, fluffy, and moist cake that’s perfect for Valentine’s Day. Hummingbird Cake from Scratch: a moist, fruity spice cake that’s popular in the South. 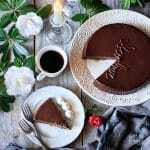 How to Make Sachertorte: this elegant chocolate cake from Austria is flavored with apricot jam. 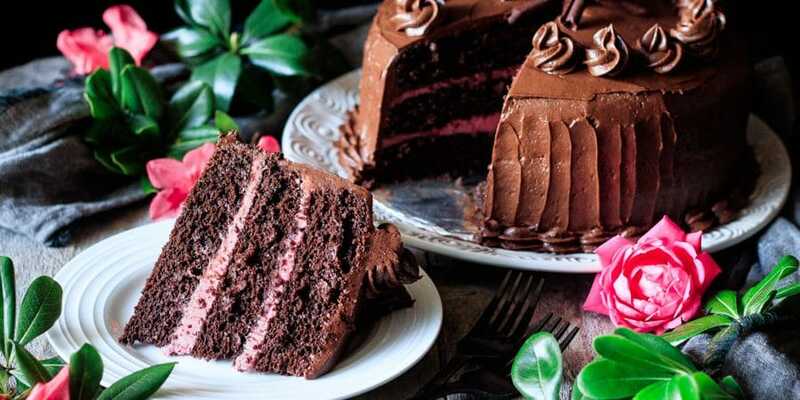 Did you make this sour cream chocolate cake? Please leave a star rating below to share how you enjoyed it. Preheat the oven to 350 F. Butter three 9-inch cake pans and line their bases with parchment paper. Sift the dry ingredients into a bowl, then whisk until blended. Whisk the wet ingredients together in a separate bowl until smooth, then dump the wet into the dry and stir until no lumps of flour remain. 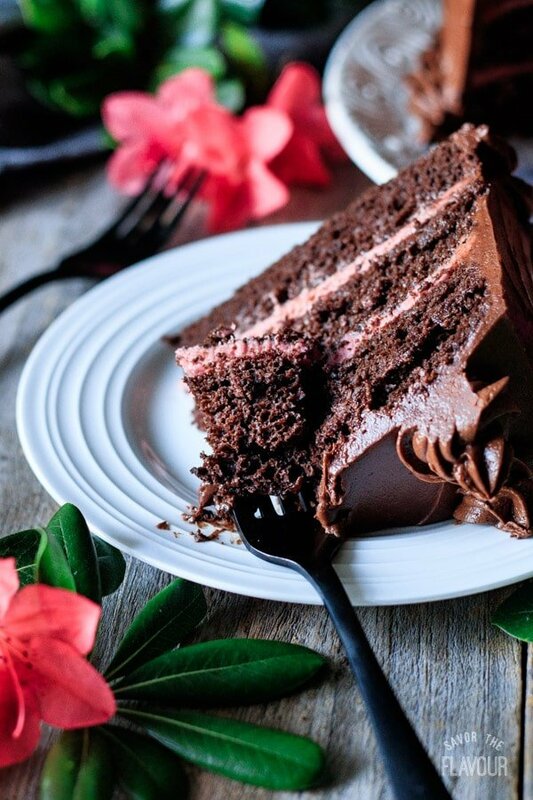 Be sure to scrape all the way down to the bottom, but don’t stir too long, or the cake will be tough. Divide the batter equally among the prepared pans, then tap the pans gently on the counter to release air bubbles. Bake at 350 F for 17-20 minutes, until a toothpick inserted into the center of the cakes comes out clean. Be careful not to overbake, or the cakes will be dry. Let cool for 20 minutes in the pan, then remove from the pan and let cool completely on a wire rack, about 40 minutes. Beat the butter and salt until smooth in the bowl of a stand mixer fitted with the paddle attachment. Add the jam and beat until fluffy, then scrape down the sides of the bowl and sift in the powdered sugar. Beat until smooth. Flip the cakes over onto pieces of plastic wrap so you can peel the parchment circles off of the cakes. Use the raspberry buttercream to sandwich the cakes together. Cover any leftover buttercream and store in the fridge. Beat the butter until soft. Sift in the cocoa powder and beat until fluffy. Scrape down the sides of the bowl, then sift in the powdered sugar and beat until smooth. Add the vanilla and espresso powder to taste, and use the milk to thin the icing to a spreadable consistency. Be careful not to overbeat the frosting, or it will have big air bubbles. Crumb coat the top and sides of the cake by spreading a thin layer of frosting on, then gently scraping most of it off. This will trap most of the crumbs to keep them from getting in the final frosting. Chill the cake for 30 minutes to harden the crumb coat. Frost the top and sides of the cake with the remaining chocolate buttercream, then decorate with chocolate curls or shavings as desired.